Bulk Domain Authority Checker PHP Script has the ability to let users check domain authority for any website as well as the page authority for any website and URL. Domain Authority is a ranking score system by the Moz team. Page Authority also a ranking system but for particular pages instead of the whole website. From the name, one can guess that it will allow bulk Domain Authority checking system. This script will allow users to check domain authority and page authority for multiple websites and URLs. Actually, it will allow checking DA and PA for up to 5 websites or pages at a time. Retrieve data with AJAX to reduce the bandwidth usage and better user experience as well as making the script faster. This PHP script uses official Moz API key. Easy to use. After purchasing this script, all you need to do is just to place it on your PHP server and put your own Moz API keys. Documentation is available. You will get it after purchasing this product. So here I have discussed some of the features and functionality of this script. 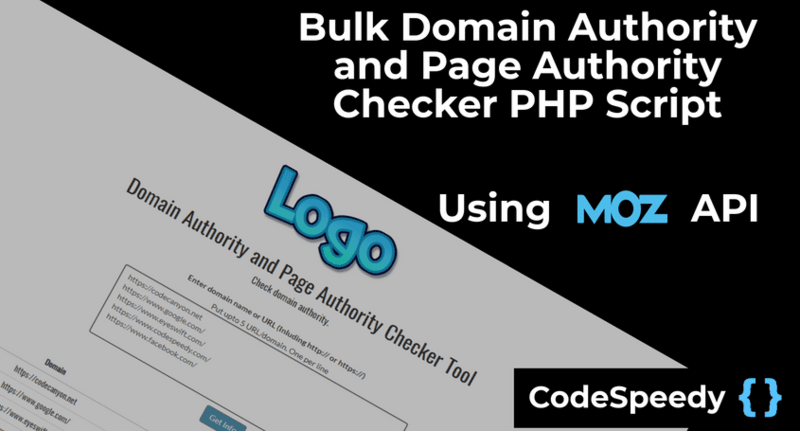 As the Bulk Domain Authority Checker PHP Script works using Moz API, so you have to get those API keys which is available on official Moz website. Website owners and bloggers always interested to see the DA and PA of their sites. So this script will help them a lot. Also, it will give you a chance of getting regular base users who are aware of the DA and PA of their site. Here is the live demo link of this PHP script. I hope, you will be in love with the simple and clean design of this product.